This Mid-Century modern style chair is perfect for creating the vintage inspired look within your interior space. Ideal for a variety of interior spaces, the chair is the ultimate in comfort with its deep seat and curved edging. Mid-Century modern design coupled with expert craftsmanship, the Tampa Dining Chair offers a timeless elegance with its winged sides and splayed wood legs. Built to last and made from beautiful Natural Wood, its versatile style and transitional look, easily blend with any existing decor, be it rustic, traditional, or a more modern space. The supportive and comfortable back offer unique and artful detail, with a rectangular insert that blends well with the beautiful easy fabric and add an understated elegance to the piece. Mix and match this chair with others or pair it with another to showcase in your living area to instantly transform the space. 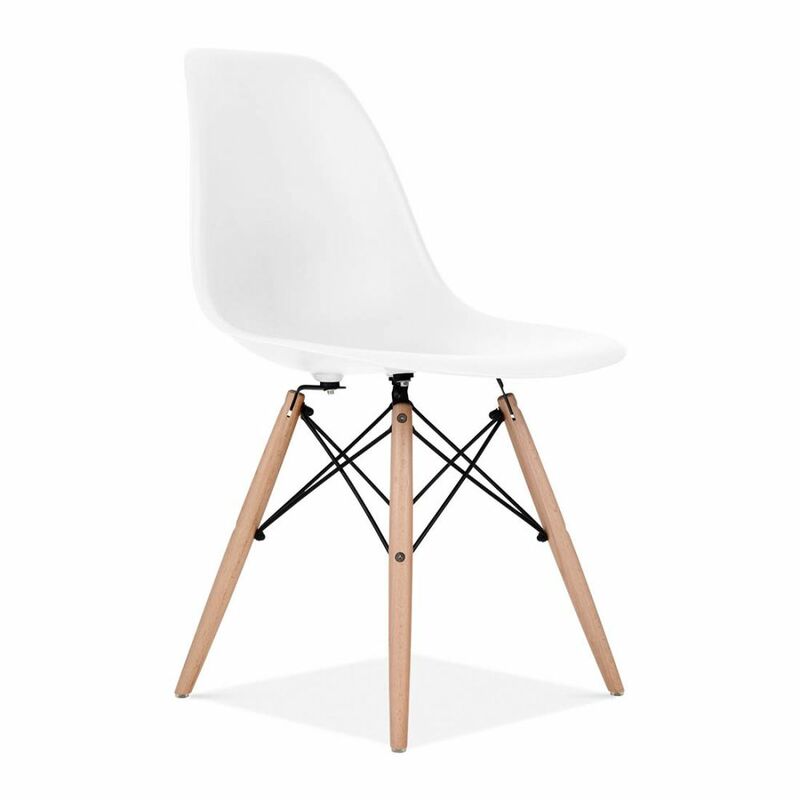 Eiffel Chair (2-Pack) This Mid-Century modern style chair is perfect for creating the vintage inspired look within your interior space. Ideal for a variety of interior spaces, the chair is the ultimate in comfort with its deep seat and curved edging. Eiffel Chair (2-Pack) is rated 4.2 out of 5 by 5. Rated 4 out of 5 by L2BR from Look great I've seen dozens of chairs this style, many costing over $100 each. These chairs look great and are priced very well. Very easy to assemble. Rated 4 out of 5 by Markus from Nice looking chairs, quirky legs Nicely packaged with a pair in the box. Great looking. But the legs are angled and the plastic caps are not exactly smooth, could scratch a wood floor. I stuck some felts on, but they keep sliding off, due to the angled legs and how weight is distributed (angled, not directly downwards). Anyone have a solution for this? Rated 4 out of 5 by MacMillan88 from Good Value These chairs are trendy and fun and really the best value we could find for a dining room chair on a budget. They are a little creaky, but I think that’s just the nature of the plastic bucket seat style. We won’t have them forever, but I’m happy with them as an economic solution and a trendy addition to our home! Rated 5 out of 5 by Vrmmmm from Surprisingly comfortable Nice chairs at a great price. Reasonably easy to construct, comfortable, and with an architectural look. I have the same question as the other person. I have looked all over and cannot find the weight capacity. I purchased a bunch today and want to know. even called and got no response please help. I can't say exactly what the weight capacity is but I have 4 of these chairs and my husband sits on them everyday. He weights 205 lbs.